Towards the end of 2012, Masako Yokota developed a cough that she thought might be bronchitis. The mother of one of her son’s friends encouraged her to see a doctor to determine the cause of the cough. When she did, an X-ray revealed the unwelcome culprit: a tumor in her left lung. A biopsy in January of 2013 clarified the diagnosis: stage II non-small cell lung cancer. “I was very lucky it was at an early stage,” Masako says. Shortly after her diagnosis, Masako received surgery to remove the tumor from her left lung. She was only supposed to have the one surgery, but she ended up going back to the operating room twice more in two weeks to treat excess bleeding after the initial surgery, and then to treat infection of the surgical site. During treatment, Masako had to sell her house and move to an apartment with her sons. She also had to put her thriving career in Silicon Valley on hold. But in the midst of treatment and the challenge of managing it all as a single mother, Masako found support from several sources. A social worker from Palo Alto Medical Foundation, where Masako was being treated, provided much-needed help. “Cancer really affects all parts of one’s life,” Masako says. “Emotionally it affected me. Financially, tremendously it did. And then of course, physically.” The social worker, she says, helped her manage all of these parts. 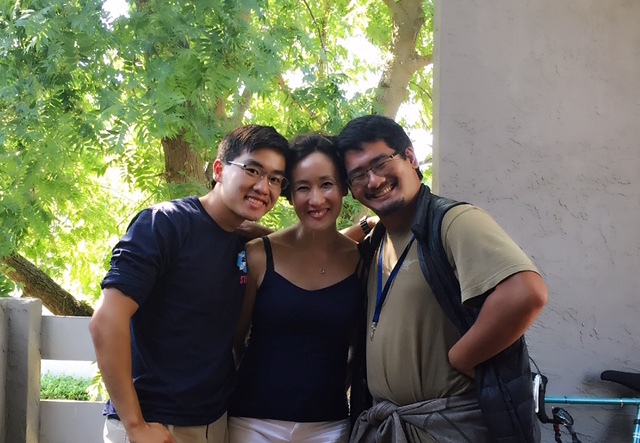 Meanwhile, Masako’s friend Donna organized a meal delivery system for her and her sons. For eight months, people from Masako’s church and from her extended network, some of whom she had never met, helped deliver food, take her sons to school, or drive her to the hospital. Masako completed chemotherapy in August of 2013. Since then, she has been in remission and is looking forward to reaching her five-year milestone in 2018. But back in 2013, achieving remission was not the end of her worries. In fall of 2013, Masako was still recovering at home and had not yet started working again, so she was struggling financially. At that point, an old friend found out about Masako’s diagnosis and came up with a creative plan to provide support. That friend wrote a simple, one-page letter about Masako and her situation, keeping Masako’s identity anonymous, and asking for donations. She sent the letter to 50 people she knew, most of whom had never met Masako. Thirty people wrote back and sent donations. Around the same time, yet another friend found out about Masako’s cancer diagnosis and treatment. That friend decided to purchase plane tickets for Masako to go to Japan so she could relax and spend time with her parents. “I felt like I could never pay back all those good deeds, so I wanted to do something meaningful,” Masako says. Ultimately, Masako found meaningful work at Cancer Commons. Since August of 2016, she has served as Director of Administration and Executive Assistant to the Founder and Chairman. Masako is open to sharing her cancer story with anyone she meets, and she takes every opportunity she can to tell friends and strangers about the services offered by Cancer Commons. She even referred her friend Donna (who organized meal delivery for Masako and her sons) to ASK Cancer Commons when Donna received a lymphoma diagnosis of her own. After her diagnosis, Masako says, she considered moving back to her native Japan many times. She credits the support she received from friends and family with helping her stay in the United States. Masako became an American citizen in 2016. Lung cancer also impacted Masako’s pursuit of music. A classical vocalist by training, Masako says music is “more than a hobby; it’s my passion.” After receiving surgery to remove her lung tumor, Masako was afraid she would never be able to sing like she used to. Masako has returned to teaching music in her spare time. And later this summer, she will perform in her very first recital since she was diagnosed with cancer.